← Get the Information You Need on Heartworm Right Here! 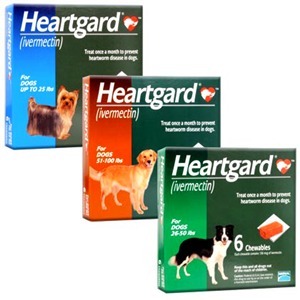 Heartgard for dogs is perhaps the most common heartworm treatment for dogs. You can choose Heartgard or Heartgard Plus. Both products are safe and effective in preventing heartworms. Heartgard Plus also prevents hookworms and roundworms. Both products contain Ivermectin, which prevents heartworm larvae from surviving in the dog’s bloodstream and is approved by the FDA for use as a heartworm preventative. There are several brand names and many generic products that also include this medicine. You may be aware that Ivermectin has been associated with side effects in some dogs, particularly collies and herding dogs. However, preventive medicines contain Ivermectin at very low dosage (when compared to other uses) so there is a much lower likelihood of any problems arising. This does highlight the fact that whilst this medicine is known to be effective in preventing heartworm, it would be very unsafe to try to administer it any other way than in an approved preventive treatment. Heartgard Plus also contains pyrantel pamoate. This drug (which can also be referred to as Pyrantel Embonate in Europe), is used to deworm animals from hookworms and roundworms. It works by making these worms detach themselves from the gut wall of the animal so that it can be passed out in the stool. This drug does not usually cause any problems for the animal because it is not well absorbed by the gut wall. Doses of this dog heartworm medicine are given orally once a month preferably on the same day each month. It is important that the dog chews the treat instead of swallowing it whole. Use a method that encourages your dog to chew. It can be broken into smaller pieces if your dog has a tendency to swallow it whole. For the treatment to be effective, it is important the dog consume the entire dose. You should observe your dog for a few minutes after the dog has consumed the treat. Follow veterinarian recommendations regarding missed or partially consumed doses. The chewables are individually wrapped in a blister pack. You should only remove one dose at a time. It is recommended you place the blister pack back in the box to avoid unnecessary light. Over exposure to light may diminish the effectiveness of the medicine. Want To Compare Other Oral Preventatives? Heartgard cannot be used for puppies less than six weeks old. It is considered safe for pregnant and nursing dogs. However, you should follow the advice of your veterinarian in this situation. Heartgard for dogs is safe and effective as long as the instructions are followed. Few dogs have experienced reaction to this medicine. Some dogs may experience a reaction to the contents of the chewable treat and not the medicine contained in the treat. Watch your pet closely after the first dose is given for any signs of a reaction. Oo Good post, I own three Afgan Hounds and four Bull Terriers, there so much fun.